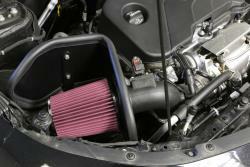 Designed to add performance to 2016-2018 Chevrolet Malibu 1.5L models, the 63-3106 K&N® performance air intake system offers a guaranteed increase in horsepower and torque for Chevy Malibus—and features a washable, reusable High-Flow Air Filter™ to help protect against contaminants that can damage your engine. A specifically designed steel heat shield helps protect the air filter from high engine temperatures, which in turn can increase engine combustion efficiency. 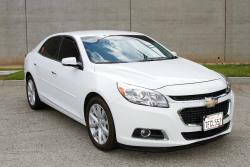 The 2018 Chevrolet Malibu offers a user-friendly infotainment system, excellent gas mileage, and a spacious interior—with a brand-new 360-degree camera now available. The 2017 Malibu was named an IIHS Top Safety Pick, and the 2018 model has received an NHTSA 5-Star Overall vehicle score. To give your Malibu an extra boost in power, check out the 63-3106 performance air intake system—specifically engineered for 2016-2018 Chevy Malibus. The 63-3106 is designed to keep air moving through the system cooler, which in turn can increase the efficiency of your engine. The 63-3106 is engineered to provide a less restrictive path for airflow; many factory intake systems include components that can obstruct airflow, and obstructions often create turbulence which products heat. Under typical circumstances, the hotter the air that reaches the engine, the less efficient engine combustion will be. By providing a smoother path for airflow, the 63-3106 helps produce more efficient combustion—giving you a boost in horsepower. Typical factory air intake systems force air through a restrictive disposable paper air filter before the air travels through a complex system of tubing. Multiple turns, bends, and baffles can significantly slow the flow of air to the engine. The 63-3106 intake system features a free-flowing, high-density polyethylene (HDPE) intake tube, which is engineered to reduce turbulence in the air, keeping engine air cooler—and increasing engine performance! A radius adapter allows the filter to mount directly to the intake tube, which reduces hardware and helps increase ease of installation. To help ensure engine performance, it’s extremely important to balance the four critical elements of filtration—efficiency, capacity, durability, and airflow. K&N’s game-changing filter design—the K&N High-Flow™ Air Filter—is designed to provide high airflow rates while offering outstanding engine protection from dust, dirt, and other harmful airborne contaminants. The filter’s innovative design of oiled, layered cotton media is washable, reusable, and durable—engineered to last for the entire lifespan of a vehicle, and backed by K&N®’s reputation for industry-leading quality. The High-Flow Air Filter™ included in the 63-3106 intake kit is oversized, providing a large amount of surface area and allowing for a service interval of up to 100,000 miles between cleanings (under normal highway driving conditions). When your filter does need to be cleaned, you can use the K&N Recharger® Kit (99-5000 or 99-5050) to quickly and easily restore your filter’s performance. Each K&N intake (and filter!) is designed to last for the life of your vehicle. The 63-3106 features a steel heat shield which helps protect the air filter—and filtered air—from the high temperatures of the engine bay. Since cold air is denser with oxygen molecules than hot air, keeping airflow cooler can help increase engine combustion efficiency. 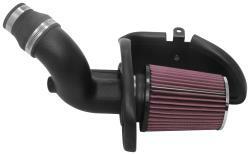 The K&N 63-3106 intake system is engineered to incorporate factory mounting points and the factory mass air sensor. Installation can typically be completed in 90 minutes or less, and requires only basic hand tools. Detailed instructions are included in your kit, and installation videos for many vehicles are available on the K&N website. Each intake system comes with a 10-Year/Million Mile Limited Warranty. Installing a K&N replacement air intake system will not void your factory warranty; in the U.S., manufacturers must provide evidence that an aftermarket part is the cause of a necessary repair in order to void or deny warranty coverage. The Consumer Products Warranty Act of 1975 (also known as the Magnuson-Moss Warranty Act) protects consumers’ rights to their warranty coverage. K&N performance air intake systems come with an industry-leading guarantee—you‘ll get an increase in horsepower and torque! During dynamometer testing, a 2016 Chevrolet Malibu 1.5L with a factory air intake system was recorded at 131.9-horsepower at 5491 RPM. After installation of 63-3106, the same vehicle was recorded at 140.4-horsepower at 5491 RPM—an estimated increase of 8.5-horsepower. The torque also jumped from 120.0 lb.-ft. to 124.5 lb.-ft.—an estimated increase of 4.5 lb.-ft. at 3156 RPM. Horsepower gains vary among products and applications, but each K&N performance air intake system is designed to increase airflow efficiency for specific vehicles and their engines. Each kit undergoes significant testing to help ensure that the filter and intake tube are engineered to deliver large increases in airflow and horsepower. Please visit individual product pages to view horsepower estimates for your specific vehicle. Visit this page to purchase the 63-3106 air intake system, or visit the vehicle application search to explore air intake system options for your vehicle. Join the millions of customers who trust K&N to help them boost performance and protection in their vehicles! * This air intake cannot be sold in California. It is not legal for use in California or other states adopting California emission standards. Not legal for highway use in states adopting California emission regulations.